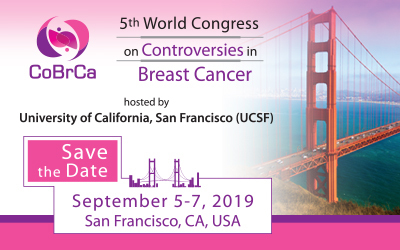 Melbourne International Joint Breast Congress – Australasian Society for Breast Disease (ASBD), 4th World Congress on Controversies in Breast Cancer (CoBrCa) and Breast Surgeons of Australia and New Zealand (BreastSurgANZ). Fees include: MIBC Congress scientific updates, newsletters, access to accepted abstracts, participation in the MIBC Congress, participation in the young scientist competition, the MIBC Congress e-Book, Congress material, MIBC Congress certificate and free access to MIBC Congress social networks, (coffee and lunch breaks), Networking Reception at the Congress. There will be 6 half day workshops which will take place on Thursday, October 11, 2018. Registration to workshops is open to participants who are registered to the congress only. *Nurses, Students, Allied Health Professionals and Consumer Advocates must provide proof confirming your status, which you will be requested to provide during the registration process. Payments should be made on the registration website by credit card or via bank transfer. Bank charges are the responsibility of the payer and should be paid in addition to the fees. A copy of the bank transfer will be required in order to confirm registration. Registration will only be valid upon receipt of full payment. Postmarked until August 15, 2018 – 100% refund (minus $ 50 handling fee). Postmarked as of August 16, 2018 until September 12, 2018 – 50% refund. No refund from September 13, 2018. The MIBC Congress cannot accept liability for personal accidents, nor loss of or damage to private property of participants, either during or directly arising from The Melbourne International Breast Congress. Participants should make their own arrangements with respect to health and travel insurance.